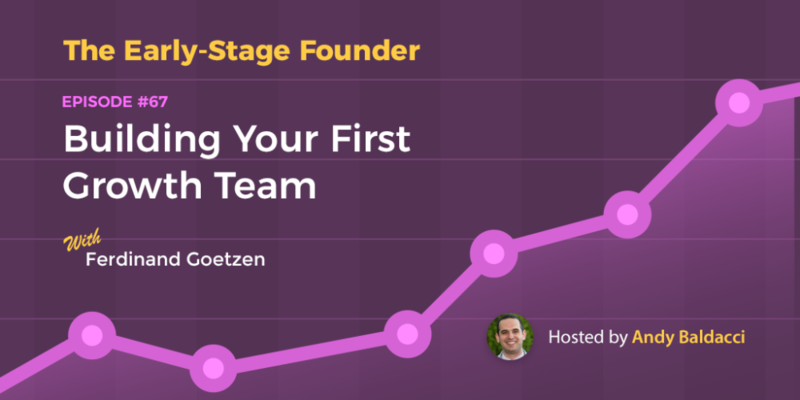 Today, I’m talking with Ferdinand Goetzen, the Head of Growth at Recruitee, an applicant tracking and recruitment startup that helps teams of all sizes optimize their hiring process. Managing growth is one of the most crucial concerns for scaling startups, and Ferdinand and his team have some data-driven insights that can turn any startup founder into a growth hacker. In our chat, we’re going to dive into how to build and run a growth team, everything from when to start to the process that will drive your own data-driven experimentation. If you’re looking to think more proactively about your company’s growth, then this is the episode for you. How is it different from marketing? When did you get started with growth? What are the different roles needed for a growth team? When should a company start building their own growth team? What mistakes do startups commonly make with their growth process? As your company grows, how does your approach to growth evolve? What gets harder and what gets easier? Are there any trends you’re paying close attention to? What is one thing a startup founder can do this week to start approaching growth more seriously? To hear more from Ferdinand, you can connect with him on LinkedIn or follow his blog. If you’re looking for a great collection of hiring resources, then head over to Recruitee.